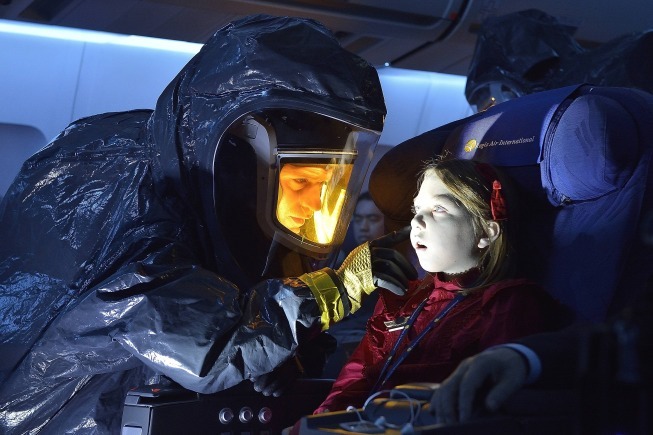 The Strain Shines Darkly – Not Sparkly! The Strain (FX, Sundays, 10/9C) brings the idea of vampires as evil predatory creatures who do not charm and most definitely do not sparkle. Adapted from the novels by Guillermo Del Toro and Chuck Hogan – both Executive Producers on the series, and writers of the premiere; Del Toro directed – this is a series to be watched with a nightlight on and the hope that it won’t inspire nightmares. Full disclosure: I read the first novel in the trilogy, The Strain, and did not enjoy it one bit. As Elmore Leonard would say, too much writing. The series – or at least the four episodes made available for review – is an entirely different story. It is compelling stuff from the beginning, when something goes wrong after a passenger jet stops dead after touching down on the runway. When airport crews check the plane, they find all the windows shuttered except for one – and the pilot does not respond to attempts to communicate. A team from the CDC – Drs. Ephraim Goodweather (Corey Stoll, House of Cards) and Nora Martinez (Mia Maestro, Alias, White Collar), and Jim Kent (Sean Astin, 24, LOTR Trilogy) – find all but four of the plane’s passengers and crew dead. Survivors include the pilot, Captain Doyle Redfern (Jonathan Potts), a rock star, Gabriel Bolivar (Jack Kesy), and a lawyer, Joan Luss (Leslie Hope, 24) – who escape quarantine through Luss’ legal expertise and politicians fearing the economic losses caused by shutting down the city. There are traditional tropes of vampire tales – the coffin filled with dirt; needing a safe means to cross water; the veteran vampire hunter, and so forth – mixed in with new wrinkles, like vampirism being transmitted via a virus. It’s a mix that requires a large scope and The Strain certainly provides that. 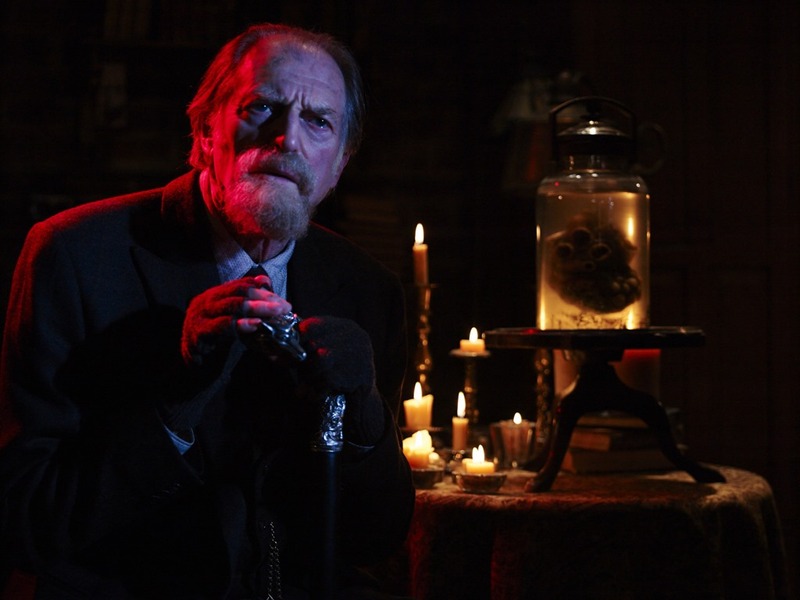 Some of the highlights include the old vampire hunter, Abraham Setrakian (David Bradley, Harry Potter series, Broadchurch), a pawnshop owner with a sword cane, who is a curmudgeon of the unlovable variety and an arrogance born of suffering fools not at all, and the two sinister gentlemen – Thomas Eichorst (Richard Sammel, Inglourious Basterds) and Eldritch Palmer (Jonathan Hyde, Spooks) – who have made an arrangement that does not bode well for practically everyone except themselves. In between setting up this deeply demented tale and introducing a host of characters, Night Zero also gives us the kind of character beats that make us identify with the characters: Goodweather is divorced and hoping to get joint custody of his son, Zack (Ben Hyland, House of Cards), though he never seems to have time for him because of his job; Palmer is dying and hopes his association with Eichorst will provide him with something better than a replacement liver, and so on. 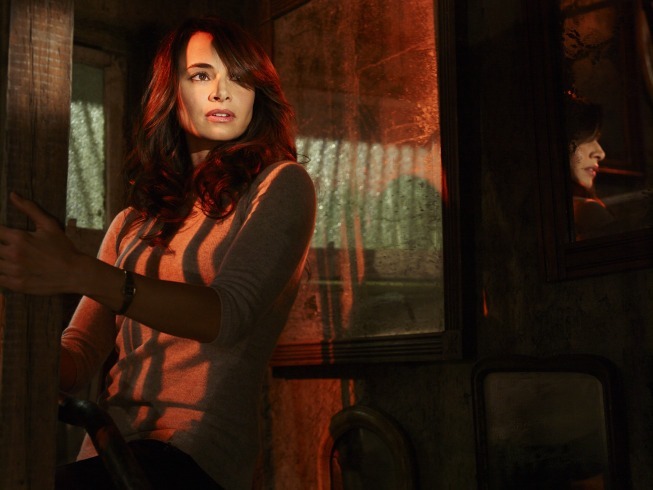 The Strain is a dark world, but it is also very vivid – colors are saturated, creating contrasts between light and shadow that look like nothing else on TV. Transformations – such as the ones undergone by Captain Redfern and Bolivar – are otherworldly and unsettling even above the kinds of violence that are unleashed throughout. It’s funny, I remember most of the events of The Strain’s first four episodes (there are some tweaks – omissions, additions) and even though I really did not enjoy the book, the series seems to be just excellent. Using my standard Three Ep Rule, I have to rate The Strain as surpassing any of my expectations (or lack of same) because all four eps provided are superb. I can’t wait to see how such disparate characters as pest exterminator Vasiliy Fet (Kevin Durand, Touching Evil, Lost) and hacker Dutch Velders (Ruta Gedmintus, The Borgias) come together with the main thrust of the story – we meet them in the first eps, but only very briefly. The TV version of The Strain made me think of Nosferatu (both versions) and Christopher Lee’s savage take on Dracula. This is genuinely scary stuff – leavened by appropriately off the wall humor (wait ‘til you see how they make use of Neil Diamond’s Sweet Caroline) – that works on any number of levels. After you watch it, you just might want to check under your bed before you go to sleep. Previous PostThe Strain: Guillermo Del Toro and Carlton Cuse Want To Creep You Out!Next PostChristopher Walken Is Hook!